Peal the butternut, take out the seeds, and cut the meat in pieces. Clean the 2 paprika’s, take out the seeds and cut them into pieces. Peal the onions and cut them in cubes. Peal the garlic and cut into small pieces. Put some olive oil or other low fat oil into a cooking pot and simmer the onions, the paprika and the garlic for a couple of minutes until the onions start to turn glazy. Add the butternut pieces and immediately cover all vegetables with water. You’ll need 1 to 1,5 liter. Add two cubes of chicken stock and the bouquet garni. 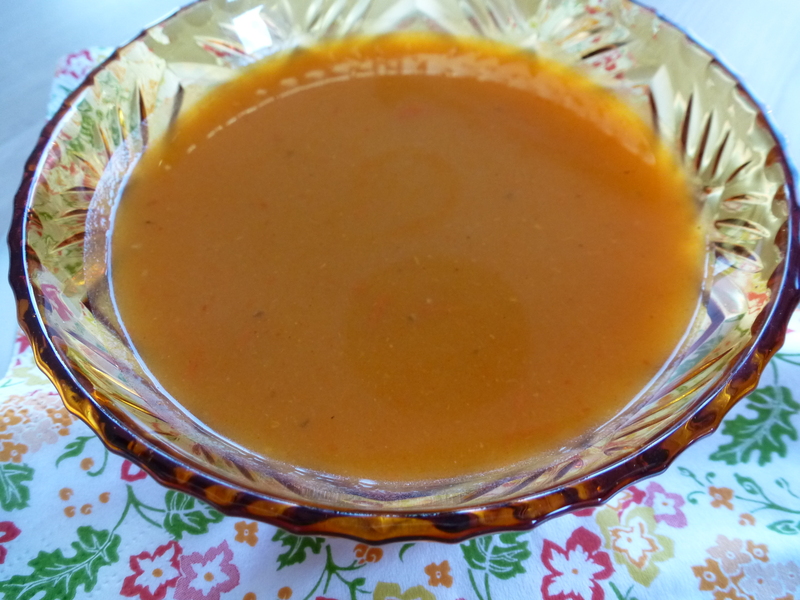 To strengthen the taste of the soup, add a table spoon of soft paprika and a pinch of sharp paprika (spicy paprika). Once the soup boils, lower the heat so that the soup boils softly for the rest of the cooking time. The paprika’s will need about 45 minutes until they are tender. At the end of the cooking time, take out the bouquet garni and mix the soup using a mixer or blender. Add some extra water if necessary, to give the soup the right consistency. Season the soup with salt and pepper. My neighbour brought me some smoked garlic the other day. I used this instead of normal garlic, and although i can’t prove nor measure it, but I believe the smoked garlic lifted the paprika taste much more than normal garlic. I’m sure if I would roast the paprika’s and peal them before using them, this would also be very beneficial for the taste of this soup. I really need to try that sometime. I hate battling against pumpkins, so I in the beginning of winter I buy a bag of frozen butternut cubes. No work, as good! Yet again the herbs are the secret to this taste. With the bouquet garni and the soft and spicy paprika herbs to the soup it gets a herby flavour and a great paprika ‘bite’. If you don’t have sharp paprika, you can replace it by chilli. For the bouquet garni I used a dry bouquet which I bought in the shop. It contained: thyme, laurel and rosemary. This entry was posted in Appetizer, Diet, Soup and tagged butternut, low calorie, low fat, paprika, pumpkin by petratant. Bookmark the permalink. I had the chance to taste this wonderful soup. De-li-cious!